American Ceramic Supply Company highly recommends to all of our ceramic customers to use Orton Cones when firing their projects for best results. Not only do you need Orton Cones if you have a manual kiln, but using Self Supporting Cones ‘on the kiln shelves’ is the best way to see what is really going on inside your kiln during the firing process. Inspecting the Self Supporting Shelf or Witness Cones after firing will aid you in determining if your kiln is firing properly and to the right temperatures. Firing to the right temperatures, ‘on the shelf’, is necessary for the maturity of your clay bodies and glazes. Choose from the Cones - all Cones come in boxes of either 25 or 50 - and then e-mail us with your list and quantities, name, shipping address - and we’ll get back to you with availability, your costs and shipping for your approval before purchase. If you have a sales tax certificate or are tax exempt, please e-mail us with that information for confidential wholesale pricing. Copies of sales tax certificates or exemption status forms must be on file before we can quote wholesale pricing. Why Use Pyrometric Cones - Cones have been used in firing ceramics for more than 100 years. They are useful because they can determine when a firing is complete, or if the kiln was provided enough heat, or if there is a temperature difference in the kiln, or if a problem occurred during the firing. What is a Cone? - Cones are slender pyramids made from about 100 carefully controlled compositions. They bend in a repeatable manner over a relatively small temperature range (less than 50°F). The final bending position is a measure of the amount of heat absorbed. We refer to one cone number as being hotter or cooler than another. The coolest cone number is O22 and the hottest is 42. The first cones were numbered from 1 to 20. When cooler cones were developed, an 'O' was placed before the number. So cones cooler than Cone 1 increase from O1 to O2, etc. to O22. Cone Bending - Both temperature and time and sometimes atmosphere affect the final bending position of a cone. Temperature is the predominant variable. We refer to the temperature as an equivalent temperature, since actual firing conditions may vary somewhat from those in which the cones were originally standardized. Using charts available from Orton, an equivalent temperature can be determined by measuring the final bending position of the Cone, if the heating rate is known. Orton Self-Supporting Cones duplicate their bending behavior with a standard deviation of 2.4 angular degrees or less than + 2°C. How are Cones used? - Cones are used as witness cones located on a kiln shelf near the ware or in a kiln shut off device (e.g. Kiln-Sitter®). The cone bends when glass forms and it becomes soft. The composition of the cone and the amount of heat determine when and how much glass is formed. 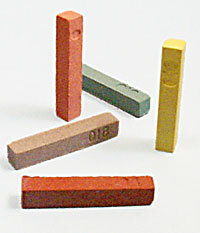 It is important to note that it is the weight of the sensing rod that causes the cone (or bar) in a Kiln-Sitter® to bend. Changes in weight affect the bending of the cone. A witness cone bends because of gravity acting on it. Therefore, mounting height and angle is important. The higher the cone or the more it leans over at the start, the more gravity affects bending, causing early bending. It is for this reason Orton developed Self-Supporting Witness Cones some 20 years ago, where mounting height and angle is fixed. It typically takes 15 to 25 minutes for a cone to bend, depending upon the cone number. The cone bends slowly at first but once it reaches the halfway point, it bends quickly. 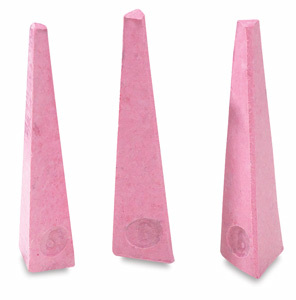 When the cone tip reaches a point level with the base, it is considered properly fired; however, the difference between a cone touching the shelf and a cone at the 4 o'clock position is small and rarely affects the fired results. For use on a kiln shelf - use with both manual and automatic or digital kilns for best results.